Merry Christmas! Because we had to renew our visas this winter, we couldn’t plan any travel outside the UK for the holidays. (But our new biometric residence permits arrived a few days ago — a wonderful Christmas gift!) No travel to the US meant planning a Christmas season of our own here in Wales. 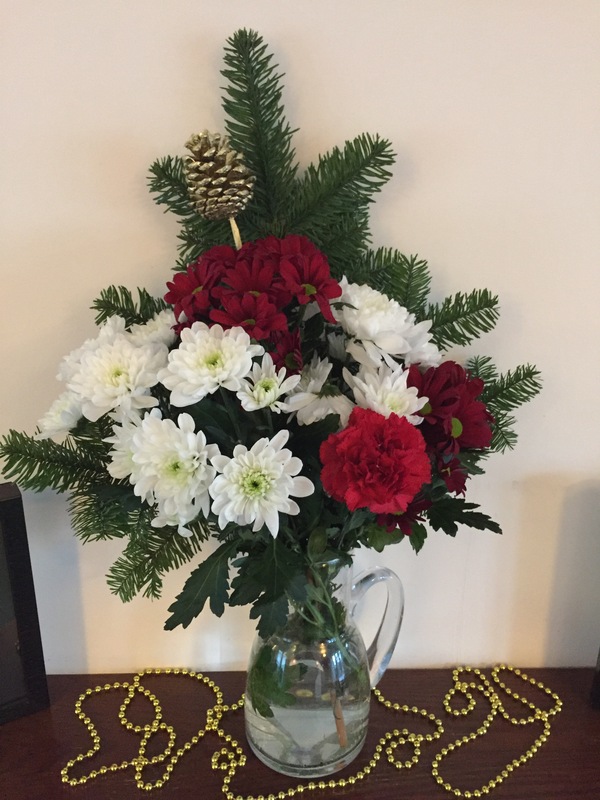 Surprise flowers and Christmas decoration — he knows me so well! It was the perfect touch of greenery for a last-minute Christmas boost. Aside from decorations, I also celebrated with some baking. I briefly considered sugar cookies but knew I wouldn’t have the patience to decorate them properly and didn’t want to have to eat them all. Instead, I went for banana bread last week and cinnamon rolls on Christmas Day. Definitely worth it. Outside the house, I enjoyed seeing the Christmas tree in town set up and decorated with lights. Many of the shops around town also had their own little trees — I don’t remember seeing this trend in the US, but the shops here put Christmas trees in the flag mounts on the front of the buildings so the trees stuck out from the wall at an angle. Is that a thing in the US, too, and I just never noticed? After a leisurely morning, my husband and I went out for a walk around town. Everything was fairly quiet — we only ran across a handful of families out and about, and based on the foreign languages being spoken I’m guessing they were mostly tourists or perhaps other expats. I pulled my husband up for a little jaunt along the town walls before we headed down to the quay and the nearby woods. Around 7 p.m. we joined my family for a Facetime gift exchange. A couple gifts I mailed from here didn’t make it to them in time, unfortunately, and the same happened with some gifts they sent us, but for me Christmas is as much about the time hanging out together as anything else. After a couple hours of gifts, stories, and laughter, we said goodbye and signed off. All in all, I’m pretty happy at how this Christmas turned out. It wasn’t our first Christmas abroad, away from family, but I think it was our most successful — which really means it felt like Christmas to me, despite the distance. That said, I think holidays are the hardest time to be an expat. Family is so important to me, and next year I plan to do whatever it takes to spend this season in person with my family. Whatever season you’re in, and whatever holidays you’re celebrating, I hope you have a joyful end of 2016! Next Next post: Goodbye, 2016!